Here’s when I last saw California State Senator Leland Yee. I was the emcee of a community event at the Philippine Consulate in San Francisco last October, and Yee was the featured speaker. The event honored the day the U.S. landed on Leyte during World War II, when General Douglas MacArthur and Filipinos retook the Philippines and changed the course of the war. Yee was there to present a Senate resolution honoring the day. I remember Yee to be all business that day, not any different from normal. He was there for the community, as always. And yet, after losing the San Francisco mayoral race and gaining a new $70,000 debt, he had the pressure of being term limited and forced to seek a new job. (Was Secretary of State, the overseer of elections, really all that appealing?) I should have sensed the musical chairs game of politics was beginning to get old. If I had, then Wednesday’s sordid tale of a bizarre and surreal FBI sting that includes drugs, convicted gang members nicknamed “Shrimp Boy,” and talk of illegal firearms from Muslim groups in the Philippines would not have been such a big surprise. But with the key figure in all of that being Yee, I have to admit to being flabbergasted. This is a case that rocks the Bay Area’s Asian American political scene hard. In the FBI special agent’s affidavit supporting the criminal complaint, Yee was accused of defrauding the “public’s right to honest services,” conspiracy to deal firearms without a license, and illegally importing firearms. The sting includes a list of suspects ranging from convicted gang members, a political consultant, and a local Filipino dentist accused of being an arms dealer. But the shocker was Yee. As a veteran observer of Asian American empowerment in the Bay Area and the nation, I was absolutely astonished to see images of Yee, 65, driven into custody at the Federal building. The local guy who made good was going down. Yee, who represents the west side of the city in the Sunset district, extending south to the part of San Mateo that includes Daly City, was essentially the key Asian American state legislator representing the Bay Area’s Chinese and Filipino populations. I’ve known Yee as a guy from my old neighborhood around Dolores Park in the city. He went to Mission High–like Carlos Santana. Often revered as one of the folks who made it, Yee was seen as the go-to guy in politics, who rose through the ranks from President of the Board of Education to City and County supervisor, to the State Assembly, where he was the first Asian American to be Speaker Pro Tem, and then the first Chinese American elected to the State Senate in 2006. Yee’s resume is like a mini-history of Asian American empowerment. And if the charges against him are true, this becomes the tragic tale of an Asian American in politics. You’ll likely hear a lot in the news about the Triad member nicknamed “Shrimp Boy.” But I was more surprised to see two other names: Filipino dentist Wilson Lim and restaurant owner Hon Keung So. H.K. So, the owner of the New Asia restaurant on Pacific Avenue in San Francisco’s Chinatown, is named in the affidavit as allegedly buying a stolen liquor license. So’s restaurant is a well-known site for political events in the city. Hundreds of people can fit in the space, and the food is cheap. One of the last events I attended there was a surprise party for House Speaker Nancy Pelosi. But Lim’s name is more critical. The affidavit cites Lim, a well-known dentist in the Filipino community, as the alleged gun dealer that Yee is attempting to connect to the FBI undercover agent. I’ve met Dr. Lim on a few occasions, but never would have suspected him of being connected to Muslim gun dealers. The affidavit says Yee suggested the undercover agent should try small deals with Lim first. It’s not clear if there was any video in the case to back up the agent’s claims. If there is, the whole thing would have similarities to the FBI’s ABSCAM sting of the ’70s. In ABSCAM, the basis of the movie “American Hustle,” the FBI used a man posing as a rich Arab sheikh whose sole existence was to bait the hook and see who would bite at the possibility of big money for big influence. In the New Jersey and Philadelphia areas, the offer was too tempting for political officials from city hall, the state house, and the U.S. Congress. Much of it was on videotape. And seeing is believing. 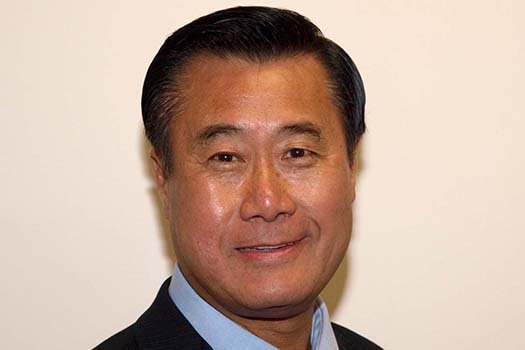 That brings us to this week’s uptype: updates date: Was this sting the Asian American Hustle of Sen. Leland Yee? Hard to say. The question could be raised that creating a fictional buyer (the undercover agent) might be entrapment. In ABSCAM, the sheikh wasn’t real. But if it’s proven that the dentist Lim was really an arms dealer and Yee was his middleman, it would be hard for Yee to maintain his innocence. The ABSCAM convictions were all upheld on appeal, thus establishing the rule book for future stings. The FBI knew what it was doing. But what about Leland Yee? We’ll have to wait and see. Yee, free on $500,000 bail, is set to appear in court on Monday. His Senate colleagues are calling for him to resign. But I think Yee deserves his day in court. As I write, I am in New York City, where I just saw the play, “All the Way,” featuring the “Breaking Bad” actor Bryan Cranston as President Lyndon B. Johnson. The play is about how the Civil Rights Act was passed and how it affected the race between LBJ and Barry Goldwater in 1964. It shows “how the sausage is made,” which doesn’t particularly make politics so appealing. But it doesn’t show how the sausage is paid for. That’s where the story about the FBI sting of Yee picks up, and why money is everything in politics. It’s to the point where one can easily imagine a politician “breaking bad.” Still, many Asian Americans are surely hoping for a different outcome for Leland Yee.